Daily Drawing Blog: Where do potatoes last the longest? Where do potatoes last the longest? My wife and I made separate grocery shopping trips this week, and we each bought a five pound bag of Yukon Gold potatoes. The second bag will be used in an experiment to see which storage conditions yield the longest shelf life. Potatoes should be stored in a cool, dark, dry cellar, but we live in a third-floor, one-story apartment. Potatoes are cheaper in bulk, so we often purchase a lot of them at once. Then it is a race against the clock to eat them before they start to go bad. 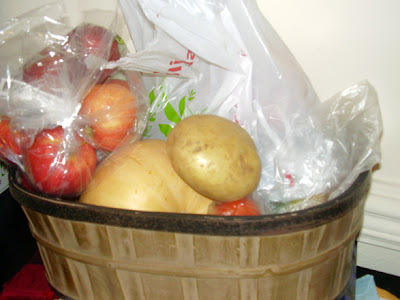 Usually we end up throwing out the last couple of potatoes from a five pound bag. Shrinking - Potatoes shrivel when they are exposed to high humidity. Greening up - This is caused by exposure to light. Sprouting - Sprouting is caused when potatoes are warmed. Moisture and light also contribute. It's the most common way for a potato to "go bad". This is the worst. It looks gross and unappetizing. I've heard the sprouting eyes are toxic. Maybe that's not true, but who wants to take chances with food? The potatoes may technically be edible after they turn these ways, but they are in a competition with everything else in the kitchen for my appetite. They won't win their way into a meal if they are ugly. Pantry closet: This is a regular upright closet in the middle of the apartment. It is dark and dry, but there's little air circulation. It also may be a bit warmer since it's farthest from the exterior walls and windows. 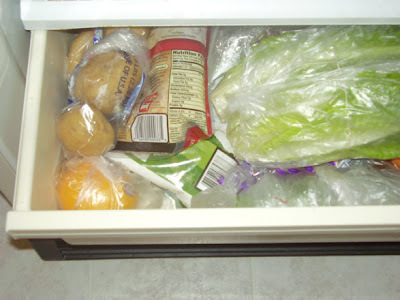 Crisper drawer: The crisper is the coldest part of the fridge. These may have an advantage because they are in the original bag, whereas the others are in checkout bags. 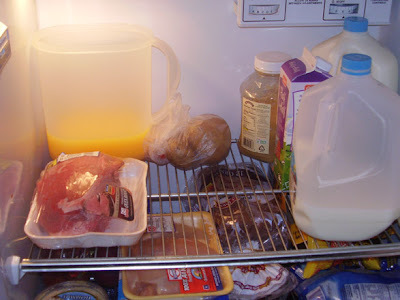 Top shelf of the fridge: A fridge may be a bit too cold according to some sources. Our fridge has high humidity from condensation freezing and melting at the base of the freezer compartment, which is on the top. It's a sort of crummy refrigerator. You may have caught that there's a leftover potato. He got stuck in the hand-fruit basket on the dining room table. I have the lowest hopes for him. He will green up from the light and warm up and start to sprout. I'm gonna call him Sean. I'm going to eat a couple of the potatoes from each group over the next couple of weeks. I'll make notes about their flavor and texture. At least one potato from each group will be allowed to go bad in one way or another. This may take a few weeks. The potatoes stored in the pantry will last the longest. Sean will go bad first. I won't be able to tell any difference when I eat the potatoes. You forgot about one other way of potatoes to go bad....putrefying. We have a really deep undercounter pantry, and a potato rolled in the way back for many moons. It basically turned to liquid inside its own skin, and only let forth its foul, foul stench when it was busted open by a can that happened to roll into it. After cleaning it up, I had to put three large bowls full of odor-absorbing baking soda in there to make the pantry useful again. Also, eyes on potatoes may be gross, so that's why you cut them off with a paring knife. Maybe it's just that I'm half Irish, but letting a potato go to waste just because it sprouted some eyes seems criminal. Other way potatoes can go bad: turning into clocks. I'm not Irish at all, so I am okay throwing out something disgusting that only cost a quarter to begin with. I make a curry with chicken, onion, and Yukon gold potatoes last night. Much yum. Also, the curry mix I used is the epitome of cooking cheating. Chock full of MSG, saturated fats, and sugar. In fact, if you blended msg, sat fat, and sugar in a blender, I bet most people would eat it with a spoon and ask for more. We're all dying to hear the results of your great potato quest. When I was a senior in college, I bought a big bag of potatoes right when I moved into a house with a bunch of guys. I figured I'd get about 20 meals out of them. I completely forgot about them in the top shelf of a pantry that we never used until I stumbled upon them near the end of the school year. The eyes on the potatoes had grown to about two feet long (no lie) and had poked their way out of the bag. 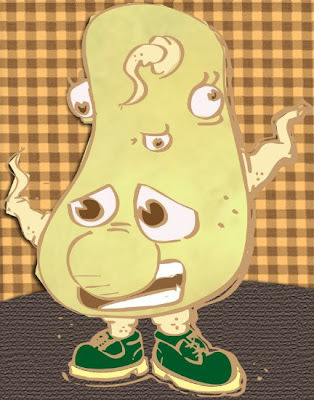 I just happened to have a roommate with an unnatural fear of potato eyes, but I just couldn't stur up enough malice to go and wave the bag at him and watch his face turn inside-out with terror. 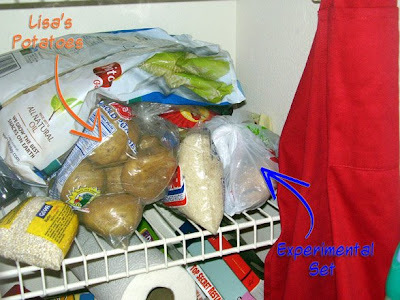 You shouldn't store potatoes in the fridge.